You are here: Home / Long Island NY Insurance / Flood Insurance in Long Island NY – Do You Really Need It? 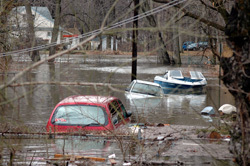 Flood insurance in Long Island NY is something some people might say is a waste of money, but floods are obviously quite common in low lying areas that are surrounded by water. In these areas, especially around Long Island NY, not having flood insurance is like playing financial Russian Roulette in the event of a serious storm. Flood Insurance If You’re Not Near Water? What about homes that are not situated right in front of a water source? Do they still need to be insured against the potential for flooding? Of course they do. As it turns out, there are many claims for flooding that come from some of the most unlikely areas. It’s not just a function of simple flooding that puts your Long Island NY home at risk. First, think about what would happen to your home even if just two or three inches of water covered your floors. How much of your personal belongings touch the floor and how many electrical cords and extension cords do you have throughout your home just an inch or two off the floor, or worse, lying directly on the floor? How many of these things will put your entire home at risk if there was even just a small flood in your home? Ground water can start to meet the rain water when the ground is saturated. It doesn’t take much to start noticing a significant rise in innocuous bodies of waters such as streams and ponds. It doesn’t take much for the overly saturated ground to start siphoning off rain water, which in turn creates flooding. Floods can happen thanks to saturation of the ground just as easily as it can happen when ground water and rain water meet to cause excessive rain runoff which can lead to flooding. No matter where you live, you may very well find that you are suddenly noticing there is an increase in water saturation after heavy rain. Just ask anyone who was in a non-flood plain area in the path of Hurricane Floyd in 1999, or anyone in non-flood prone areas where Hurricane Katrina wrecked havoc. Every region runs the risk of flood waters these days, even in the Long Island NY area. Flood insurance is not expensive and it is a simple way to protect your home in the event of a serious disaster. It takes very little water to do a tremendous amount of damage that can cost you thousands upon thousands of dollars right out of your pocket if you don’t have flood insurance. Flood waters can creep up on you quickly and be right at your front door before you know it. One simple flood insurance policy can mean the difference between being financially wiped out and being able to rebuild. If you have questions about flood insurance, check out the information at the FEMA website about The National Flood Insurance Program.